The Best Pizza in the Eastern U.S.
Best Pizza in the Eastern United States! Alabama Anniston/ Saks Carpenetti's rheeric "... I have never tasted a pizza as awesome as the 431 store in Saks. They are huge too! They have to be crammed into a large box! AWESOME TRUE NY ITALIAN TASTE!" 51 Great Pizza Parlors "...super-fresh ingredients; the right low-yeast, low-sugar flour; and a $20,000 Napoli-made oven that burns white oak at 850 degrees. At temps that high, the thin-crust pizzas cook evenly in 1� minutes, ensuring a perfectly singed crust and ingredients including prosciutto and fresh mozzarella that retain their integrity. "Everything about our pizzas is alive,"
Alabama Cullman Carlton's Chughey "Crust and sauce make it great." Alabama Daphne Cousin Vinny's drewbaxter "5 Cheese pizza is awsome! Some of the best crust I've ever had!" The Pizza Promoter "New York style pies crispy and dripping with mozzarella." "The pizzas are awesome". "The Best Pizza South of New Jersey." Turk Reno said ""Ozio is easily the dining that you�d wished you�d always knew about � a best kept secret of the Eastern Shore and Daphne, if you will � for an absolutely world-class and stellar experience." Alabama Gadsden Mater's tgmorgan "The service is slow and rude, which is part of the charm. Has been for 30 years. Pizza has a distinctive flavor that is hard to describe, but the place has been packed for years, so that says enough." Alabama Huntsville Terry's Pizza Mark "Its the crust & the sauce. Its simply the best in town. Not a chain but good old down home pizza mak'in!" Joe "C'mon, this is by far the best pizza in the South. Joe Carlucci's "Sydney" pizza wonfirst place. The crust is perfect. The "carlucci" and "Gemignani" are unique and out of this world. The taste is authentic Neapolitan, even better. Trust me, I'm an Italian." Alabama Mobile Papa's Pizza MMcauliffe "The pizza is always fresh, plus the use of Franks Red Hot Sauce makes me weak. One of the best pizza I have ever had.."
the pizza was that good!" Save up to 61% and get FREE Gifts from Omaha Steaks. These steaks are amazing! Venice Restaurant leeroy / Roy "Total Zen. "/ "The pie is an equal to the best being offered." Mr. G's Irv Nielsen A..."sweet pie in Connecticut... their spinach and feta is to die for." Recovery Room Albert Grande, The Pizza Promoter, The Pizza Promoter, The Pizza Promoter "Great pizza. Unique variety." Phone : (860)274-1348 Chris "...my favorite pizza in CT next to Pepe's. The pizza is a thick, brick oven style pizza. My grandmother refers to it as "the way pizza used to be made". I like their pepperoni but that's my favorite topping as it is. They ship their pizzas out in the old fashion paper bags. No boxes here...Ro's has a rich history of being family owned and is a staple in the Watertown/Waterbury area when it comes to pizza.."
Harry's Pizza wemurray "Harry's has a nice thin, crispy and chewy crust, a tasty sauce, which has fresh basil and small chunks of tomatoes..."
"bubbles" in the crust - oh that was the best part!!!" Congratulations! Get a FREE $1,000 South West Gift Card! Lewes Mr. P's Pizza and Pasta flounderhook "This pizza is the best tasting pizza in Delaware. From the all fresh ingredients to the brick oven. The sauce is simple and very flavorful and the toppings are always fresh." This pizza has a unique taste unlike all others...the sauce, the crust, the cheese. Atlamonte Springs Specialty Pizza Express Whicker_Josh "Everything about them is great. They have the biggest variety of toppings, excellent service and many different types of pizza." Boca Raton Red Rock Coal Fired Pizza gicko "...coal fired crust - the sauce has a very refreshing taste - it's just a great upscale pizza place - with great food and great service - I love it!!!" Boca Raton Thick and Thin Pizza lex2lo "They have the best sauces and pizza I have ever tasted"
Coconut Grove Slice & Ice W.K. "...A true New York style slice, folded and eaten standing up! Great crust, toppings..."
Coral Spring Pizza Time Joe "Great sauce and that's what counts.enuff said just go and taste for you self. It is amust." "Angelina's makes the best pizza in Florida". "The food is wonderful and every customer is treated like a friend. Wonderful atmosphere! Where people are always welcomed and you will always be made to feel at home." in the traditional Italian red, white, and green colors." (and I am NOT related!)." Fort Myers Pizza Express dogface "The crust is perfect. Thin, crispy and with a great flavor..."
forget his Sicilian pies, either, to die for!!" Rudy "The sauce is off the chain, the crust is crispy and these guys are real Italians there rolls are the best ,too so it must be the dough, come to the 305 and don't miss this pizza you won't regret it." and cheese also all the toppings they use, are fresh. Fort Lauderdale Anthony's Coal Fired Pizza guyfrmbk "Truly Authentic Old Fashion Way brought here from Naples. Born and raised an Italian I know Pizza and I love it. I now live in Florida and have found a place that makes Pizza better then NYC !! It is made in a Coal Oven Very Hot with Plum Tomatoes Fresh Mozzarella and Basil..The Margherita." Oven Pizza Denise "We went to this place and it's wonderful, you sit outside under the palm trees and it's got great atmosphere. The car wash next door is so quirky and fun." Miami Archie's W.K. "...truly a "gourmet pie" with excellent components... One of his signature pies is the "Garden Pizza", mozzarella, gorgonzola and topped with a fresh SALAD of marinated artichoke hearts, mushrooms, ham, arugula and Caesar dressing." Miami Frankie's Pizza Nanarmp "Was voted one of the top 7 best pizza places in the U.S. because of it's thin and crispy crust!!" Crust charred on edges, firm but creamy in the middle. Sauce is rich & savory. Amazing buffalo mozzarella. Consistently execution to perfection. ...Also has the best antipasto platter I've ever had..."
(386) 428-8738 Pete "Friends brought us there and OMG!! What a difference a fresh pizza can taste like. I hope you post this little blog because you will make a world of difference to a wonderful family. Please try this one out!" "...they make even better pizza than in New York. The sauce is outstanding...it's the best slice I've ever tried in my life". North Port Nona Rosa Tarrant Sinclair Q. What makes the pizza special? The sauce? The crust? The service? A. "All three are awesome at Nona Rosa!" Orlando Michael's jvolosin "The sauce has a great fresh tomato flavor. The toppings are fresh and the crust is perfect..."
Orlando NYPD Pizza mallysab "This pizza is the real deal authentic New York style pizza and simply amazing. Theatmosphere and staff are awesome, I love this place!" Orlando Rossi's tre "Rossi's has the best crust in the world. They also have a killer sauce that brings your taste buds to a level of utopia -"
Forno's jayt "The thin crusted pizza is made in a wood-burning oven. The toppings are most creative..."
Florida Pizza Kitchen pasttime "Top-notch crust and limitless toppings. Nice atmosphere too!" 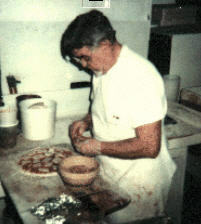 Pensacola Georgios carl "The owner still makes the sauce and dough daily himself daily. He is a fanatic for freshness." style pizza. The owners are from New Jersey and make their pizza exactly the way you would get it up there." so its that real New York pizza taste with the real New York pizza atmosphere! Not to mention all the other delicious things on the menu. My family and I are from New Jersey so we know our pizza!" Pompano Beach Umberto's Of Long Island No Say "... They have a brick oven pizza. It is about the best I've ever had anywhere..."
Ray "Da Vinci's pizza is just like the pizza I grew up with in New Jersey. Crunchy crust, creamy cheese and a raw crushed tomato sauce..."
"It's all good, the sauce, the crust and especially the cheese! And it's made the old fashion way - hand tossed and stone baked, Yum!" so far from a major metropolitan area." but the food rocks--you decide--I have!" an amazing taste for a great price! Its always busy there. Half the kids from high school go there for lunch. The slices are BIG! The taste is mouth watering!!!" St. Augustine Borillo's Pizza melcrowe "The brick oven cooking combined with the right amount of crust, cheese and sauce makes this the best pizza outside of NY." on the bottom from being baked directly on the stone oven. Good quality "Mozzarell"
and they had anchovies, proving that they know what real Italians like on pizza!" Tampa Eddie and Sam's itcoa "an excellent NY style pizza." Tampa Mellow Mushroom angelaswafford "Spring Water Stone Baked Crust and only the Freshest toppings! Perrinellis soctmonster "The crust is what truly makes this the best pizza ever." Tampa Roma Pizza aellis "This place rocks. The best authentic hand-tossed NYC style pizza in Tampa. The the crust and the sauce is great....Very consistent." Vero Beach Marotta's Joe "Just wonderful thin crust pizza. Very fresh crispy crust with homemade sauce. Nottoo much garlic just the right spices. Great cheese and toppings. I like thevegetarian the best it is just heaped full of vegetables." the oven and use the best quality, fresh ingredients... "
"Their crust, sauce is just phenomenal..."
Johnny's Pizza gr8pizza "The crust is great, they use great tomatoes for their sauce." Atlanta Mona Lisa msisti "A true "New York Style" Pizza...No toppings needed to give this pizza taste. Great sauce, perfect crust and good baseball conversation!!" "The brick oven cooking combined with the right amount of crust, cheese and sauce makes this the best pizza outside of NY." Atlanta Varsano's Pizzeria Albert Grande, The Pizza Promoter, The Pizza Promoter, The Pizza Promoter "The name says it all. This is a world class pizza. Jeff's pizza is outstanding..."
Austell Brooklyn Pizza Department dallen "Hand Tosses, spring water- NY attitude...the pizza, people and place are awesome!!" Decatur MojoPizza frederin "It's the sauce that makes this the best pizza in Atlanta. Mojo also has the most creative combos menu in the South." "Wedgee's Pizza is the best you will ever find. The sauce taste like it was freshly made from the garden..."
Norcross CK�s Grilled Pizza Tom Boyles "They have over 15 original combinations and use combinations of ingredients that range from caviar to goat cheese..."
Roswell Pizza Fiore vito "...an authentic New York pizza. Any of the wide variety of pizzas is covered with incredible, superior cheese. The sauce is not too sweet, not too bland. The crust is perfect..."
Secrets Inside the Pizzeria "Sal is a former boxer...he makes the whole thing fun... He raises the bar way above anything I ever had before...He does not only pizza but the most wonderful Italian entrees you ever tasted anywhere..."
Houma West Main Pizza & Spaghetti Drew "Holy Mother, this is good pizza! The place doesn't look like much, but oh my, theirtaco pizzas are beyond compare! I have never had a bad bite at West Main, and I amnever disappointed! You won't regret eating here; this pizza is worth every cent!" on toppings. Deluxe and Masterpiece are favorites." Louisiana Pizza Kitchen tlois "Great brick oven pizza- a hard item to find around here!!" Jimmy The Greeks Brick Oven Restaurant Pizza Blog About How to Eat Order Pizza On Line "...The truth is that the true value in this pizza restaurant is in the atmosphere. This place was very lively and fun. Jimmy the Greeks has a different event scheduled for every night of the week. If I was a local then I would be there at least once a week... "
Ricetta's Holly Valero "Thinner crusts, brick oven cooking. And loads of dripping, heart stopping toppers!" 410-563-1600 Kevin Bacon "B.O.P. should stand for Baltimore's only pizza". Statement "Step into another world and discover a glimpse of Italy. Envision balls of cheese, cloves of garlic, baskets of peppers and the tantalizing smell of fresh baked bread and pasta dishes coming from our kitchen." 410 545 0444 Baltimore City Paper "Monster-sized square pizzas with stellar ingredients and fresh herbs on tasty thin crusts�." "The crust & the sauce." 410-687-7733 filmore "If you ever make to Maryland, You HAVE to stop in Pizza Johns. They have won best pizza in Baltimore many times." in Western Mass. Great brick oven pizza. Thinner crust which is unheard of in these parts. The pizza comes out looking like old school Italy. Great tasting nutty crust,unbelievable fresh sauce and just the right amount of cheese and toppings. Family run with the BEST personalities around!!! Tiny tiny little place but that is whatadds to the nostalgic atmosphere. My favorite special pizza is their white. WOW!" 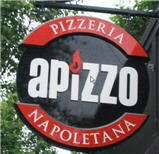 "The atmosphere is great and the pizza is absolutely delicious. My favorite is Chicken Bacon Ranch and no one anywhere makes it as good as them and their prices are outrageously low. If you're a college student at UMASS or just passing through you have to eat here!!!!! I live here luckily so I can enjoy it all year round!" right. FINALLY, a Boston area pizza that rivals New Haven and New York!" Pizza: A Slice of Heaven! The crust is �crisp on the outside, tender on the inside�puffy and chewy.� "
10 miles for this pizza..."
Tom "This place very close to a Pepe's pizza. It's oven cook, thin pizza, and a finely cook crust. It's very nice. They also have a few locations in Boston." and tangy sauce. So good." Emcee "... They make a medium-thick pie and lay down rectangles of mozzarella on top only. The sauce is delicious and they cook it just enough to get it to meld in right with the cheese. Excellent." Jim "One of a kind family recipe since 1953." eckrosky "It's the first right when you come out of the tunnel heading to Logan. Teresa "The sauce is like no other.We always get a pizza house pizza when we visit Mass.We live 4 hoursaway." yossarian "The Marchetti's "Original crust" is what makes it the best." Marian "The sauce and the crust is awesome!" james "Wood fired oven, Richard Bourdon natural sourdough crust!!" pepperoni. I only get the cheese. I think the fact that they don't have to deliver and have been in business for many decades speaks for itself. " chart "This pizza rocks!!!! Perfect thin to medium inner crust and nice thick outer crust. Great blend of cheeses and the perfect sauce. And they are BIG!!!!" boomer "I love Pepe's in New Haven and Regina in Boston but Monte's on Eastern Ave in Lynn has a pizza that is unlike others. It is a 10-12 inch pizza, carcker thin with sweet sauce and an awesome blend of cheeses. The sausage pizza is to die for! Looks like a dive but great family restaurant..."
rblauner "...it is the only pizza that reminds me of my youth...it's perfect." fioil "Eat it there and it's great. Get it to go and it loses something. I've had pizza from different places all over the USA. This is one of the best. They don't spare the cheese or the toppings! Friday nights it's the best, don't know why." "The Sauce is Good but the laced crust is wonderful. It really is the BEST pizza on the east coast!!!!" enough to spend my time online and rave about it! "This place has the perfect pizza. The crust is always golden brown, lots of yummy cheese. This place has been around a long time for a reason." 10 Pies Worth Every Mile "...Enrico�s is a favorite with families, who come for the brick oven pizzas, spicy wings, and good selection of salads. Specialty pies include the scampi, a thin-crust white pizza topped with grated Parmesan, grilled shrimp, roasted garlic, and mushrooms...."
"..Town Spa is the best....I say that now after 40 years traveling around the world ...I knew it was good then but never knew just how good! Whenever I get back east I always drop by to say hello and enjoy a great tasting cheese Pizza." mrzie "Established in 1930, it is the oldest family owned restaurant in the city. It is often compared to Pepe's and Sally's in CT. The Wonder Bar has won the local print media's "Peoples Choice" awards for best pizza for the past 6-8 years. Thin crust, great sauce, crazy service." tom@pmq.com "At Old Venice Pizza, guests are treated to a �new South� urban dining experience through a selection of gourmet pizzas." Alex "The sauce is excellent! The crust is amazing. You can tell it is homemade not out of the can and it is fresh. When the owner was asked what is in their sauce and what makes it so good, he replies "their is a secret ingredient in it, if you can tell me what it is, I'll give you a large Pizza for free". I couldn't figure out what it is!!!" with a thick outer rim..."
dupebovine "They just don't skimp on quantity and quality of ingredients...umm umm." craving it right now) Variety of topping choices is great too. They have 2 locations (Auburn too)and they both live up to this review. This is not another bland pizza joint. Zacky's is well worth the visit or two or three, and so on." cantrall "The sauce and crust are awesome!!" atmosphere, and most certainly the pizza. The perfectly warm crust, spiced and savory sauce, and the flavorful cheese make this pizza something for which to die (not to mention the curious yet delicious spinach pizza). The only drawback is the price, though the incredible quality is worth every cent"
10 Pies Worth Every Mile "...I happen to think it�s the Coevolution, topped with roasted red peppers, red onions, olives, goat cheese, garlic, and mozzarella. Much of the produce is from local organic farms � and you can taste the difference...."
dkirkpatrick "The sauce is very good and the crust is a perfect balance of sweetness and texture. Toppings are top notch as well. Definitely the best pizza I've had in the past ten years." New Hampshire Raymond Pizza,by George! wmm "Best crust, sauce, everything!" Rocko's beach babe "The crust is crunchy and cheese and topping are to perfection. The service is on the money..."
New Jersey Belmar Vesuvio's glenn "...The pizza is outstanding including the evenly baked crunchy crust and the thin layer of sauce is magnificent. The service is horrible taking at least an hour to get your pizza on a busy Friday evening...This is simply the best pie on the Jersey Shore or anywhere else!!!" New Jersey Bradley Beach CBO Pizza cardguy "...made in... coal-fired brick oven... All fresh ingredients ... they make their own fresh mozzarella, dough, and sauce. They add fresh basil to every pizza..."
New Jersey Bridgeton Big John's Pizza Wilbert "Big Johns Pizza is awesome. It is unlike any pizza you have ever eaten. It isn'tdoughy and sauceless, it isn't a flat New York style... it's The Lasagna of Pizza!" John reports: "Enzo's been closed for several years now, essentially a family decision after the passing of Enzo Avallone himself, a good man, father, former employee of the Italian State Railways, and one heckuva pizza chef...."
"The whole pizza is delicious! The crust is soft and has a great taste.The sauce is perfect ..."
fcdadino "I have yet to find better pizza..."
firwave "It's just the real deal. Italian pizza the way it should be." mpcmike "The sauce taste like homemade ... tomato sauce my grandmother used to make..."
and the crust is well done and crisp on the edges." Dana "It is just the perfect blend of everything! It's amazing!" jlaslave "Huge, square "Sicilian Style" pizzas are the only choice of pies...but what a great choice it is!!!" Aaron Nathans "...some of the best New York pizza anywhere. Thin but not crispy." pescegrande "FANTASTIC! This is the tomato pie I grew up with: thin crust, great sauce. Its a small place but I think its the Best kept secret in New Jersey." mcbjam "The crust is thin and crispy, the sauce is awesome, and the price can't be beat..."
that doesn't exist anymore. It's excellent and I almost hate to let the secret out." "Best crust, best sauce, best cheese and no frilly toppings. Pizza at in it's truest form. Definitively, the best pizza ever." "I've had pizza from all around, but I dare anyone to taste Pizzatina and say its not the best... "
Definitely one of the best!!!!!!!!!!!" dineatpetes "... in operation for over 40 years!! We are a Bar , Restaurant and Pizzeria ALL UNDER ONE ROOF! Quite Unique!!! " nicoletta "Sauce, crust, best service..."
pericson "The crust is so thin and crispy. If you can eat a whole pie by yourself, you get a T-shirt! Just the right amount of sauce and hot bubbly cheese..."
and not too thick, and always crispy. They are never skimpy with the toppings!" dangagen "A hole in the wall pizzeria since the mid 60's. Featured on the opening credits of "The Soprano's". Best pizza I've ever had. I've brought people there from other states, and they agreed. I moved away years ago, and a few times a year, I will make the drive just for this incredible pie. Minutes from the Meadowlands. It's worth the trip." always hot, and made with fresh sauce. The best is the sausage pie." ...thin crispy crust, ovens that rotate the pizzas so they are always cooked evenly, the best sauce and without a doubt the best tasting cheese I have ever had on top of a pizza..."
Kevin Holland "Claimed by thousands of loyal customers to be the best they've ever had. Star Tavern pizza remains the original and most famous pizza and pizzeria in New Jersey..."
jablippy "Paper thin and crispy crust. Just the right amount of sauce and cheese." Mike "Old World makes a very unique Pizza, and it tastes like a slice of heaven (no joke intended). I highly suggest that if you are anywhere in the Princeton area that you stop by this place." pizzas I have ever had." john "They only make small personal pizza's but they are the best.Unlike any other pizza in the New York Area. Ultra-thin crust and fresh tomatoes and mozzarella with basil make it worthwhile. But its all about the crust." "The best pizza in town for 30 years, best crust, sauce, and cheese." "They make great anchovy pizza. The people that work there are always nice." New Jersey Saddle Brook Cuz'n Vinnie's gimmedattoo "Best pizza in Bergen County! Thin (not too thin), crunchy crust isn't overpowered by the sauce or the toppings. Toppings are VERY generous and it's always hot and crispy, even when delivered." "... The crust is nicely encrusted with particles of cornmeal or farina on the bottom. It has a classic, simple tomato sauce seasoned with oregano. And they use real mozzarella (Moot �za �rell) It's even better than the pizza I had on the Isle of Capri, off Napoli!" New Jersey Seaside Park Maruca Tomato Pies Mike "...for people visiting the Jersey Shore don't miss out on Maruca Tomato Pies in Seaside Park, it's a must. They blow away most others in the area....Maruca offers more than just an oversized slice loaded with mozzarella, it actually has a better taste...."
New Jersey Seaside Park Soprano's Pizza "It's a combination of great and I mean great tasty crust. Sauce that's not sweet, not bitter but nicely not over-spiced and topped with a quality cheese that would make any cow proud. All together, wow what a pizza...mmm, I'm hungry now..."
New Jersey South Orange Bunny's Tavern andrewbottomley "The combination of paper thin crust, and a perfect ratio of sauce to cheese. The motto of this restaurant must be, "thin thin thin", cause you can eat about 70 slices and still not feel full." New Jersey Summit Summit Brick Oven metaljaybird "Perfect thin crust, sauce is a good tomato flavor, the service is friendly." New Jersey Toms River Avellino Pizza & Pasta knarf "The pizza is 24" ROUND pizza (Jumbo). The crust is not thin. The sauce is not to sweet or spiced. Topping is always fresh and not from a can." Pizza: A Slice of Heaven! "Everything ---- it is simply the best I've ever had"
"Thin crust, outstanding sauce, real cheese, great pizza makers." New Jersey Wildwood Jumbos Pizza moviegurutim "Best on boardwalk, right off of Morey's Pier. They have huge slices." Mack's Carolina Jude "You won't find better "beach" pizza anywhere!" "...the crust is great and the sauce to die for..."
Discover an incredible amount of digital resources. located on Wooster St., New Haven, Connecticut. For visitor comments about Pepe's click: HERE!